Paul Gauguin Cruises, operator of the highest-rated and longest continually sailing luxury cruise ship in the South Pacific, m/s Paul Gauguin, has announced 2017 voyages that feature popular favourites along with new, exotic 16-and 17-night Fiji & Bali itineraries and a collaborative program with the Wildlife Conservation Society. In 2017, The Gauguin will also be showcasing its most sought-after itineraries: the 7-night Tahiti & the Society Islands; 7-night Tahiti, the Society Islands & Tuamotus; 10-night Society Islands & Tuamotus; 11-night Cook Islands & Society Islands; and 14-night Marquesas, Tuamotus & Society Islands. Also in 2017, the popular 12- and 13-night Society Islands, Cook Islands, Tonga & Fiji itineraries return. 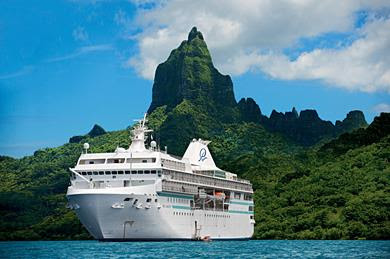 In addition to sailing to beautiful islands in the South Pacific, and showcasing Polynesian culture and hospitality, these voyages feature complimentary access to Paul Gauguin Cruises’ two exclusive retreats—Motu Mahana, an islet off the coast of Taha’a, and a private beach in Bora Bora. At Motu Mahana, guests enjoy a day of watersports, Polynesian activities, a barbecue feast, and cocktails from full-service and floating bars. In Bora Bora, guests can relax on a white-sand beach and enjoy refreshments, a game of volleyball, and snorkeling in crystal-clear waters. On The Gauguin’s July 26, 2017, voyage, Paul Gauguin Cruises will present its third Reunion Cruise, which features a special 10-night Cook Islands & Society Islands itinerary with two visits to the line’s private island paradise of Motu Mahana. Designed as a reunion for past guests of Paul Gauguin Cruises and as a gala welcome for newcomers, it presents a number of unique special events, including a festive dinner, cocktail events and parties, opportunities to mingle with senior staff and crew, and more. Paul Gauguin Cruises is also pleased to announce a new global collaboration with the Wildlife Conservation Society (WCS). WCS has been committed to saving wildlife and wild places worldwide since 1895. Beginning in 2017, WCS will offer educational programming for adults and families aboard The Gauguin. Our series will comprise lectures about marine science and wildlife conservation in the South Pacific and beyond. Additionally during the summer months and holiday season, WCS will inspire guests to value nature through our experiential family program. WCS aims to protect half of the world’s biodiversity, while ensuring a positive impact on millions of people. Paul Gauguin Cruises is proud to collaborate with WCS in support of a healthy and sustainable planet. For rates or more information on Paul Gauguin Cruises, please contact a Travel Professional, call 800-848-6172, or visit www.pgcruises.com.